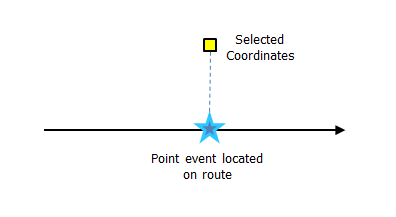 Point events such as anomalies can be represented as a single point event, with the measure information along the route. 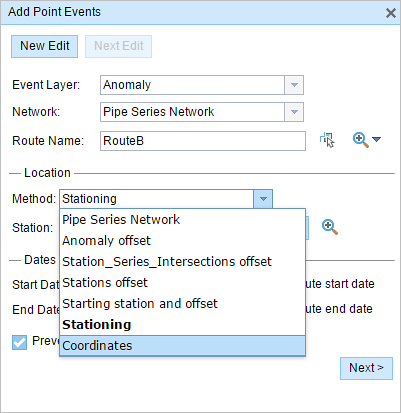 The Add Point Events widget allows you to create new point events by typing or selecting its x- and y-coordinates on the map. If the coordinate location does not fall on the selected route, then a point on the route that is nearest to the coordinate location is chosen to locate the event. Input the x- and y-coordinate values for X and Y, or select a coordinate by clicking the Select an X/Y Location on the Map tool. If the Route ID is specified, the route measure closest to the original coordinates will be selected, and its distance from the route will be displayed. Optionally input a value in the GC Factor text box if relevant. This will adjust the coordinates by dividing X and Y by the value specified for GC Factor. 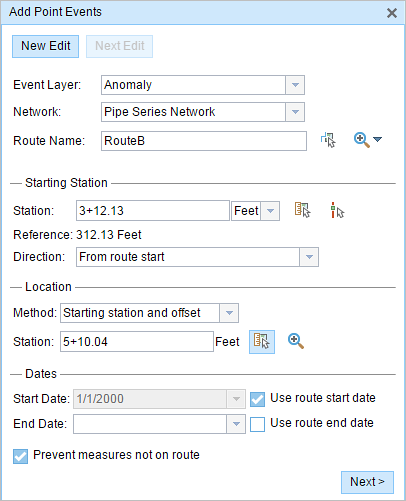 LRS Spatial Reference—The spatial reference of your LRS Network. Web Map Spatial Reference—The spatial reference of your basemap. GCS_WGS_1984—A geographic spatial reference using units of degrees. Additionally, you can configure different coordinate systems by specifying the Well Known ID (WKID) in the configuration file of your Event Editor. For more information, see Configuring the Event Editor (EE) web application. A yellow square is shown at the x,y coordinate location if Show XY Location is checked. A red cross is shown on the route at the location of the point event.